We love trains, so much so that over the years many of our European vacations were planned around train schedules and where we could find a station. Once we had settled on France as the country to where we’d be moving, we then had to choose a city or town and one item that was on the must-have list for any final choice was a train station. So then, why do you see a picture of a bus here? About an hour south of Carcassonne is the beautiful small town of Quillan that initially made our shortlist of places we might want to live. It truly is right at the foothills of the Pyrenees with the same river Aude running through it that we walk Heather beside a few times a day here. It also has a train station but with a population of 3,400, there’s not a big demand for frequent rail service. If we lived in Quillan and wanted to travel an hour north to Carcassonne by train we could do so twice a day only: at 6 AM or at 2 PM. Not very convenient. Enter the bus. 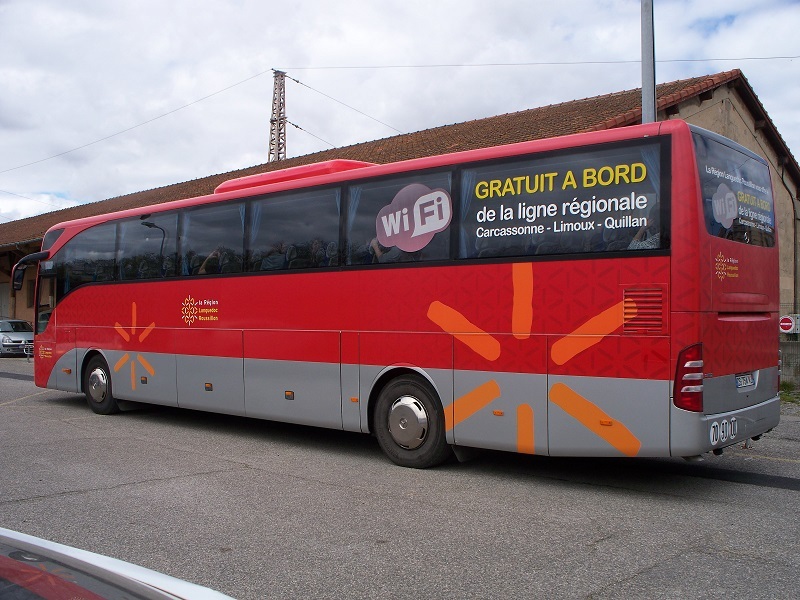 To supplement the train service, the national rail company, SNCF, hires a motorcoach to essentially follow the route of the tracks and make the journey every couple of hours throughout the day. 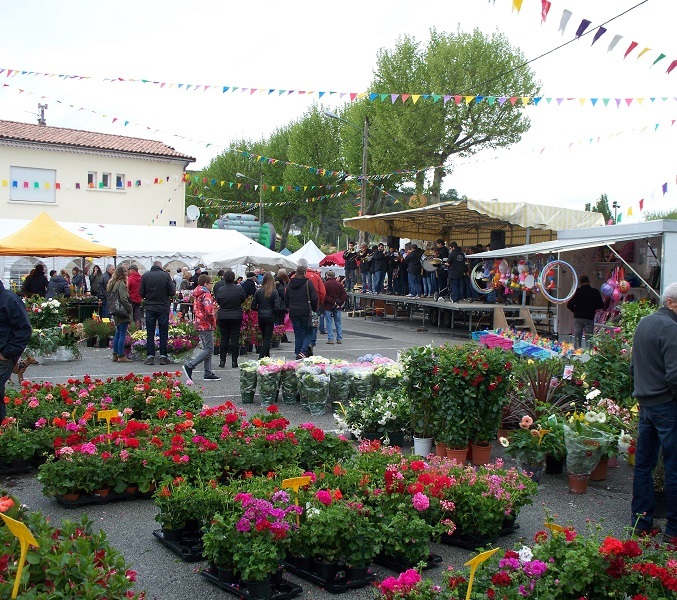 We did exactly that last Saturday, one way by bus and the way home by train, to attend the annual Flower Festival in Quillan. 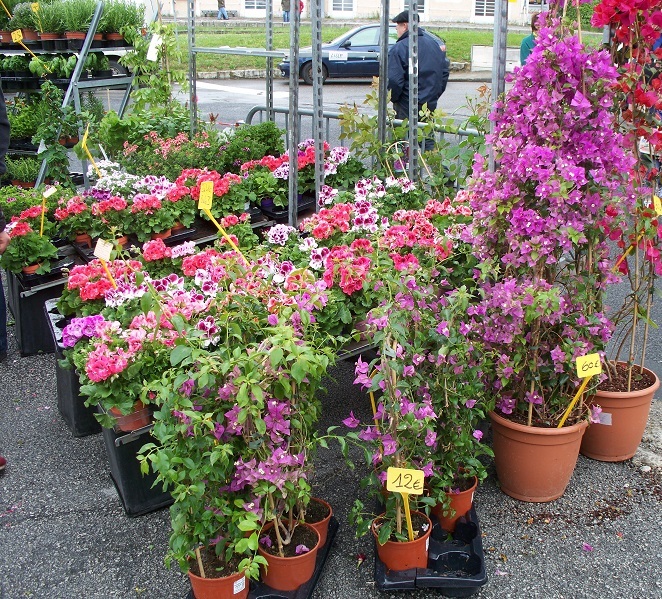 As if this charming small town with the mountains in the background needed more color, once a year one of the squares becomes an outdoor flower garden filled with a rainbow of every kind of blooming plant imaginable. In the spirit of a true festival there’s live music, food booths, a flea market, plus arts and crafts. In the wine tent we met the festival organizer and his wife who insisted on taking a selfie with us to prove that some Americans had traveled “all the way from Carcassonne” to attend their event. The entrance to the festival was free and the round trip bus/train tickets cost us a total of 4 euro or about the cost of 2 bottles of wine from the supermarket. Not a bad deal at all. Posted on May 2, 2016, in Life in France and tagged Americans in Carcassonne, Day trip, Markets, Public transportation. Bookmark the permalink. 2 Comments. Sounds wonderful!! You two certainly manage to be photographed by local photographers often!